On 7th July 2005 (1) four suicide bombers attacked central London by letting bombs off in their rucksacks. The explosions killed 52 people, maiming and injuring hundreds more. The 7/7 attack is the worse single terror atrocity to have taken place in Britain. On the morning of July 7, 2005, Mohammad Sidique Khan, Shehzad Tanweer, Hasib Hussain and Germaine Lindsey met and headed to London by train. The suicide bombers went on to detonate four bombs, three on the London Underground and one on a double-decker bus. 12 years on, criticism is circulating about the lack of public inquiry into the 7/7 bombing, despite continued calls by the relatives of the victims and survivors for an official inquiry. In 2010 – 11 an inquiry described as a ‘mockery of an inquest’ was held following public pressure. The inquest was led by Lady Justice Hallet, who was acting on the advice of the Ministry of Defence (MoD). According to a (2) report in the Plymouth Institute for Peace Research (PIPL), the inquest was closed to the public and the report from the inquiry is a mere 65 pages in length. The PIPL’s report was published in 2015 to mark the ten-year anniversary since the atrocity took place. The inquest report, says PIPL, cites anonymous witnesses and spends an “Inordinate amount of time” focused on the background of just two of the suspects, as well as on the response of the emergency services. During the inquest, no autopsies were carried out on the 52 victims and Hallett had relied on the MoD Colonel’s opinion that the victims had died as a result of the explosions. Debate emerged over the result of the explosions. The police widely reported that the devices used in the attacks were homemade hydrogen peroxide bombs. However, experts in terrorism claim the bombs were of a military grade. Despite the conflict in opinion over the explosives, no forensic evidence was published concerning how they were made. The PIPR report, which claims that still no justice has been done for the victims and survivors of the deadly terrorist attack in London in 2005, also points to how Hallett chose not to include the suspects in her inquest. Instead of putting the four suicide bombers who were responsible for the bombings and therefore making the total number dead 56, Hallett put the number dead at 52. On top of what many believe to be an inadequate inquiry, the public record about the 7/7 attacks titled ‘RE Conspiracy Theories – What Happened at Canary Wharf on 7/7’, has been closed. Held by the (3) National Archives, Kew, the record, which dates from December 30, 2010, has been closed for 100 years. 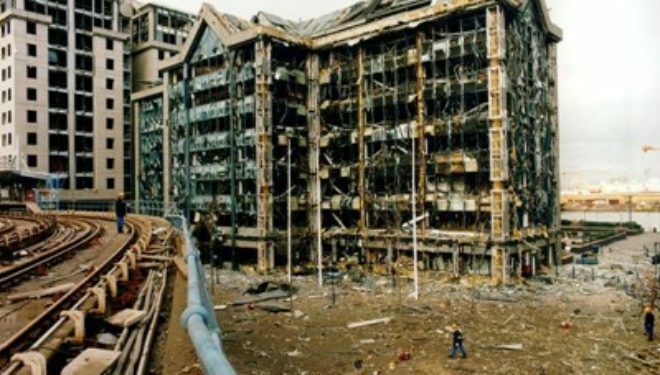 A so-called ‘mockery of an inquest’, together with the fact the public record on the Canary Wharf terror attacks has been closed for 100 years, provide a breeding ground for conspiracy theorists to make claim 7/7 is the victim of some kind of government coverup. The lack of official information about 7/7 has contributed to the swarm of questions being asked about what really happened in London on July 7, 2005. Former Guardian journalist, Mark Honigsbaum has been implicated with ‘accidentally fuelling 7/7 conspiracy theories.’ Working for the Guardian at the time, Honigsbaum went to the incident on Edgware Road as the chaos was unravelling. The journalist spoke to two witnesses, who told him ‘they believed’ the explosion had come from ‘the undercarriage of the train.” Honigsbaum filed an audio report for the paper stating it “was believed” the explosion had occurred under the train. It was later verified from witnesses’ closer to the scene that the explosives had gone off in the carriage itself. Like 9/11, the 7/7 terrorist atrocities in London have been the subject of conspiracy theories on the blogosphere. Whilst some conspiracies may hold greater credibility and plausibility than others, it is difficult not to be wary of the UK’s decision to coverup official files about the terrorist attacks for 100 years.